The essence of veganism is nonviolence and respect. Ask anyone if they wish for an end to violence and with very few exceptions the answer will be a resounding yes. Yet at the same time we are participating in horrific violence every day of our lives. The majority of the products we choose to use on a daily basis come from unspeakable violence wrought against billions of sentient beings, simply for reasons of pleasure (“they taste good”; “I like my leather boots”) convenience, or trivial amusement. Despite the obvious connection people wonder why there is so much unnecessary violence in our world. We fill our days with violence, voluntarily. We are wearing it, sleeping in it, eating it, teaching it to our children. The good news is we can stop so much of it so easily. By being vegan! 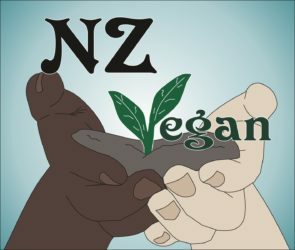 Veganism is true nonviolence—anything less than veganism involves slavery, torture, exploitation and slaughter, and you can’t get more violent than that. As long as we continue to be violent towards vulnerable nonhumans, we will continue to be violent towards vulnerable humans. Humans are animals too—being nonviolent to animals includes being nonviolent to each other. Speciesism is often used to justify violence against all other animals as somehow “not violent”! Vegan advocates have literally had that said to them, multiple times: “But what we do to other animals isn’t violent!” When prodded, the justification for that thinking inevitably turns out to be: “Well, because they aren’t human.” They are “different” from us. Sound familiar? The exact same kind of thinking has long been used to justify all violence, including that against other humans. Just as a person can choose not to be racist in their own life, they can choose not to be sexist, or heterosexist, or speciesist. Each individual controls his or her own choice to be prejudiced or not (and whether or not to teach it to their children). Being vegan is as necessary to nonviolence as is being non-racist; non-sexist or non-heterosexist, etc. Nonviolence does not exist without veganism. Nonviolence begins with what you put in your mouth, and wear on your body. One of the reasons why being vegan is so rewarding is that by making a few simple changes we are able to eliminate just an absolutely astonishing amount of violence from our lives. There is so much violence in this world that is seemingly out of our control, it can be overwhelming. By being vegan we regain some control over the amount of violence that touches our lives; it is incredibly empowering and the good it does is endless. Anyone can decide to go vegan, and they can do so immediately. Just make the decision—after that there are things to learn, because animal use and animal products are so ubiquitous. No one realises just how much animal exploitation they are participating in until they decide to stop doing so. There is nothing stopping people from making the decision to be vegan, apart from speciesism, fear and/or a lifetime of conditioning, coupled with a ton of misleading information and misrepresentation about veganism—which is why vegan education is so important. As long as human beings continue to endorse and commit violence, especially in the name of “good”, which is what all wars and conflicts have always used to justify atrocities, violence will never end and the victims will always be the innocent. As it is now and as it has been for time immemorial, with people justifying violence in the name of “good” and the innocent always lose. * Peaceful and nonviolent does not translate to “passive” or “inactive”. The abolitionist movement is all about action! Nonviolent action.